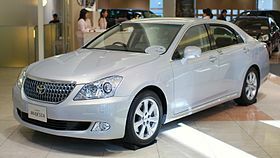 The Toyota Crown Majesta (Japanese: トヨタ・クラウンマジェスタ, Toyota Kuraun Majesuta) is a full-size flagship premium luxury automobile from Toyota. The Crown Majesta appeared after the international introduction of the Celsior/Lexus LS in late 1989; the Celsior was exclusive to Toyopet Store locations on a new platform. The Crown Majesta, positioned as a modern limousine alternative to the already existing Century and shares the flagship role, was exclusive to Toyota Japanese dealerships called Toyota Store. 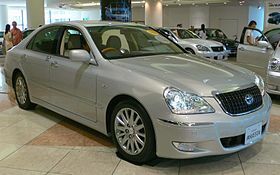 The Crown Majesta appeared before the Aristo/Lexus GS, which was assigned to Toyota Vista Store locations and shared the Crown and Crown Majesta platform. The Crown Majesta shares a stretched variant of the UZS platform series from the smaller Crown and Aristo/GS, however, it is not just an upper trim level of the Crown sedan, the Majesta is a separate car with unique styling and interior treatment. The Crown Majesta has recently been released in other countries in Asia such as China. The first Crown Majesta was introduced in Japan as a 4-door sedan in October 1991. It looked very similar to its smaller sibling, the Crown. It also bore a resemblance to the larger Celsior, which was a sedan that appeared in 1989. At first, the Crown Majesta was a trim-level variant of the Crown series, called the Crown Royal Saloon G. The Majesta was an ultra-luxurious variant of the Crown and was slightly wider and heavier, necessitating two engine choices: the 3.0 L 2JZ-GE I6, which produced 168 kW (225 hp; 228 PS) and the 4.0 L 1UZ-FE V8, which produced 191 kW (256 hp; 260 PS). The two engine choices gave Japanese buyers the option as to which annual road tax obligation they were willing to pay. In 1992, four-wheel steering was offered in compliance with the all-wheel-drive system, called 4WDi-Four. This boosted handling capabilities and gave increased traction. Advanced for this time, the Crown Majesta had an optional GPS navigation system, electronic instrument cluster, electric power steering, heated front and rear electric seats, a head-up display that projected key information on the inside windshield surface above the instrument cluster, and an i-Four comprehensive vehicle control system. In 1995, the Crown Majesta was the first Toyota to be equipped with vehicle stability control. Prices for the Crown Majesta started at US$32,100 for the lowest spec 3.0A model and rose to US$51,000 for the V8 with four-wheel steering. The Crown Majesta underwent its first redesign in 1995. Notable enhancements were made to the tail lamps to distinguish the model from the lower-spec Crown. The redesign made the vehicle similar to the Celsior and LS 400 (UCF20), which debuted in 1994. Changes were also made to the engine lineup. The 3.0 L engine stayed the same, but the V8 powered one received a power increase to 195 kW (261 hp; 265 PS). Due to cost-cutting efforts within Toyota, the list of optional equipment offered was simplified. The second generation Majesta is the first Toyota to be equipped with vehicle stability control in 1995. At its introduction in 1996, it won the Automotive Researchers' and Journalists' Conference Car of the Year award in Japan which it shared with the 1996 Crown. In August 1997, the front grille was restyled and HID headlights were introduced. VVT-i technology was offered on the V8 engine, improving the horsepower to 206 kW (276 hp; 280 PS). A 5-speed automatic transmission was also introduced. Four-wheel steering was no longer offered. In addition, a new two-tone paint scheme offered an upmarket image for the Crown Majesta. Known as the S platform, this version was released in September 1999 and received a complete redesign, further incorporating styling elements of the popular Celsior/LS. Wider vertical tail lamps were incorporated as well as redesigned headlamps, grille and minor aesthetic updates. Four-wheel steering was again offered. The previous two-tone paint scheme options remained as well as Toyota's other top of the line features for this model. DVD-based GPS navigation was also introduced, as well as an "Ottoman" footrest for the rear passenger seats. This was achieved by enabling part of the seat cushion of the front passenger seat back to tilt rearward towards the rear seat passengers. The model came in a C type or an A type option, the A type having less standard options with conventional spring and shock suspension as standard, whilst the C type had more options as standard such as height adjustable air suspension, TEMS, dual zone climate control, rear wheel steering and power rear seat as standard with leather as optional. Both the 3.0 L and 4.0 L variants also had the option for 4WDi-Four all-wheel-drive system. The S170 Crown Majesta received an updated version of the 4.0 L engine with VVT-i, now rated at 216 kW (290 hp; 294 PS), while the 3.0 L option was unchanged. The trend among automakers towards large-diameter wheels with low-profile tires was ignored in favour of a good ride and better handling with smaller wheels. The 170 series model also made available with a new 5-speed Super ECT automatic transmission. The S170 Crown Majesta was made the official company car for senior-level Toyota management. This model of Crown Majesta also had a 10th Anniversary special edition run which was a fully optioned C type specification model with leather and a sunroof as standard. The fourth generation Crown Majesta received a complete redesign when it was introduced on July 6, 2004. In August 2006, the Celsior was no longer offered in Japan, due to the introduction of the Lexus brand there. The Crown Majesta replaced the Celsior, despite objections from Japanese customers. It introduced the first Vehicle Dynamics Integrated Management (VDIM) integrated vehicle handling and software control system and radar adaptive cruise control with low-speed tracking function. The engine was upgraded to the 3UZ-FE V8, shared with the USA-spec LS. The transmission was upgraded to a 6-speed automatic, the all-wheel-drive system was improved, and the air suspension was introduced. Intelligent adaptive front lighting and rear curtain airbags were added to improve safety. Enhancements were made to the interior of the vehicle, including a rear-view camera and parking assistance technology. A supercharger option was also offered with a 6-speed transmission, allowing the engine to produce 253 kW (339 hp; 344 PS). Prices were around US$69,400 for the Crown Majesta AWD. In July 2004, the Crown Majesta introduced both a lane keeping assist and a radar pre-collision system with a single camera to improve the accuracy of collision forecast and warning and control levels. For 2006, G-Book was added to the list of standard features, along with a rear-view camera. A departure from previous models, the two-tone paint scheme was removed to target a younger audience. For more information, see Hongqi (marque). In China, this generation of the Crown Majesta was rebadged and has been sold as the Hongqi HQ300/HQ430 from 2006 to 2010, using the same engines as the Crown. On March 26, 2009, the fifth generation Crown Majesta was introduced. Design similarities between the Crown Majesta and the current Camry have been noted, especially in the grille. Although it was initially reported that the name "Crown" would be removed, establishing the Majesta as an independent car, this did not happen and the car remained the Crown Majesta. The body size expanded from the previous generation, now comparable to the LS. As with the GS and LS, the 4.6 L 1UR-FSE V8 engine is standard, however, the all-wheel-drive employed the 4.3 liter 3UZ-FE one. The larger engine incurs a higher road tax liability than the smaller 4.3 L engine. In China, FAW Toyota assembled a limited number of LHD Crown Majesta S200, which is called Crown Royal Saloon VIP. Another car based on the Crown was called the Hongqi H7 and has been in production since 2013. There are three engines choices available: a 1.8 L turbocharged I4, a 2.0 L turbocharged I4 and a 3.0 L naturally aspirated V6 all paired to a 6-speed automatic transmission. Launched in Japan on September 9, 2013, the sixth generation model replaced the outgoing model's V8 engine in favor of Toyota's 3.5 L V6 hybrid powerplant shared with the GS 450h premium sedan, plus an additional 2.5 L I4 hybrid engine for the all-wheel drive version. The elimination of the V8 engines reduced the annual road tax liability for large engine displacement. The Crown Majesta was given an all-new appearance after the reintroduction of the Nissan Cima in April 2012. Fuel economy is now greatly improved to 18.2 km/L (51 mpg‑imp; 43 mpg‑US) under the JC08 test cycle. The wheelbase is 75 mm (3.0 in) longer than the corresponding Crown Royal and Athlete, but 100 mm (3.9 in) shorter than the Century, and incorporates advanced safety and convenience equipment such as blind spot monitoring and a collision avoidance system. The Majesta is priced from ¥6,100,000 to ¥12,900,000 (including consumption tax) and the monthly sales target for Japan is 500 units. The sixth generation model Crown Majesta was discontinued on April 27, 2018 in favor of the fifteenth-generation Crown. ^ "75 Years of TOYOTA | Technical Development | Chassis". Toyota. 2012. Retrieved 2018-07-20. ^ "75 Years of TOYOTA | In-depth Vehicle Information, Specification | Crown Majesta 3rd". Toyota. 2012. Retrieved 2017-07-23. ^ "J-Spec Imports". www.j-spec.com.au. Retrieved 2017-06-27. ^ "75 Years of TOYOTA | Technical Development | Electronics Parts". Toyota. 2012. Retrieved 2015-01-02. ^ "Toyota Crown Majesta undergoes complete redesign". The Auto Channel. 2004-07-06. Retrieved 2015-01-03. ^ Frank, Randy (2004-10-11). "Really Playing it Safe". Design News. Archived from the original on 2008-10-27. Retrieved 2015-01-03. ^ "75 Years of TOYOTA | In-depth Vehicle Information, Specification | Crown Majesta 5th". Toyota. 2012. Retrieved 2017-07-23. ^ "クラウン マジェスタ | スペック" [Crown Majesta | Spec] (in Japanese). Japan: Toyota. Archived from the original on 2014-04-13. Retrieved 2014-04-10. ^ "TMC Launches New 'Crown Majesta' Sedan in Japan" (Press release). Japan: Toyota. 2013-09-09. Retrieved 2014-04-10. Wikimedia Commons has media related to Toyota Crown Majesta.